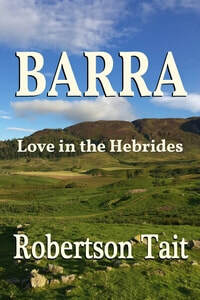 The current giveaway is an electronic copy of my eBook entitled Barra. A feel-good novelletta set in a remote Scottish island, ideal to dip into just before going to sleep. The email address you enter here will be used only to send you Robertson's newsletter, updates and advance notice of free content and giveaways. At this time, I anticipate sending out one or at most two newsletters per month (and probably less). Your email address will never be sold, shared or added to any lists other than this one.